This beautiful series introduces children to friends whose stories will teach them virtues and holiness. Children learn to love others as they follow the Gospel just as these great Saints did. 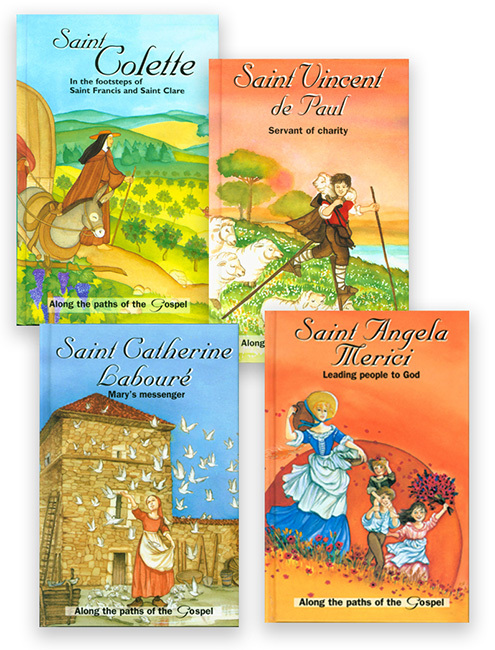 This beautiful set includes: St. Angela Merici, St. Catherine Laboure, St. Vincent de Paul, and St. Collette. You will want to buy this classic book set while it is still available! Recommended as 3rd and 4th grade readers. Full color illustrations. Hardcover. Copyright 2000. Each book is 72 pp. This set had been advertised as a 5 book set, but St. Anthony of Padua is out of print and no longer available. These are beautifully illustrated and written books. They are written at a solid mid-elementary level so that these students can benefit from richer content. Yet they still have plenty of the colorful illustrations that enhance the reading experience for the children. My daughter and I loved the two we had. I highly recommend this series! The best early easy read saint stories I have found. We read them over and over. Wish there were more I could get.